Today was a very eventful Saturday for the Hawkins clan. This morning, after sleeping in for a few more hours than we get to during the week, Drew and I headed out to do our respective workouts. I stuck to running on the treadmill in the apartment’s gym while Drew met up with the local running group. He came back to the apartment pretty convinced that I could hold my own within the group. I keep saying that I’m going to move my runs outside but keep hesitating for one reason or another. Hopefully next weekend I’ll finally commit to running with the group. Shortly after our runs, while we were still sweaty, we headed out to the Piedmont Dog Park. The mid-60’s temperatures make this feel like no January I’ve experienced; back in Kentucky we’d have at least one snowfall by now. Apparently everyone else had the same idea, as the dog park was one happening place. 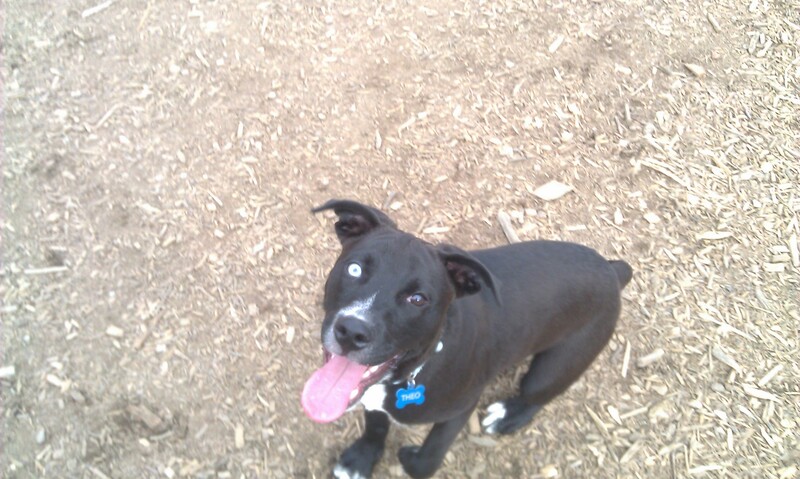 Theo had a blast at the dog park! Since Theo graduated from the smaller dog park to the bigger dog park last weekend, we headed into the area where the 30+ pound dogs play. Already there were dozens of dogs running, playing and even wrestling with each other. Since I’d never been to the park before, and knew that Theo could be a little hesitant around other dogs, I was afraid to let him off his leash at first. When I did I half-expected him close to our sides, even plop down on my feet. But he was off like a bolt of lightening, making friends with other dogs (and their owners). He looked like an old pro navigating the park, though he had no interest in playing fetch. Drew is looking forward to playing fetch with a Frisbee when he gets a little bigger. Several people commented on his beautiful eyes and even though his foster mom told us he was a Lab/Australian Shepherd mix, we’re convinced he has a bit of Pitt in him. Since Pitt Bulls are a banned breed in our apartment, we’re keeping that little bit to ourselves! 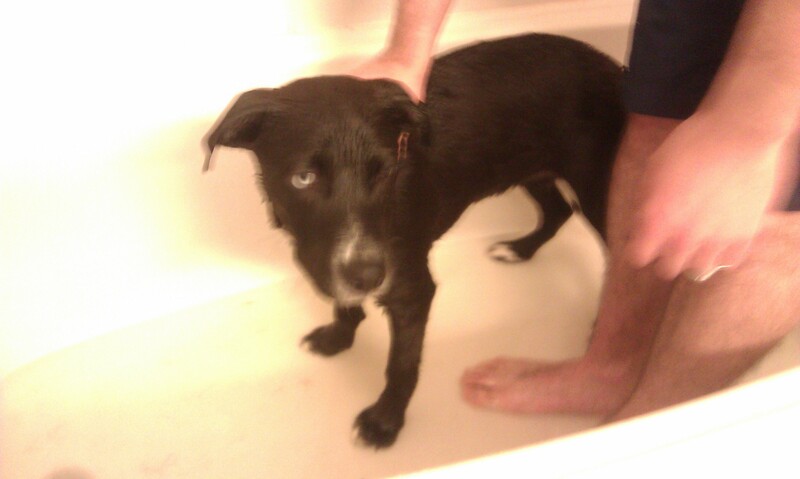 Theo getting bathed. He wasn't really a fan, but it had to be done! On the way back to the apartment we decided that Theo was in need of good bath. While at the park, a much larger dog had been running and couldn’t put the breaks of fast enough, essentially pummeling right into Theo and sending him rolling through the dirt. His once black, sleek coat now had a brown tint to it. We armed ourselves with several old beach towels and shut the bathroom door, preparing for the worst. I had images in my head of black fur, everywhere. Even though he wasn’t a fan of the hard water pressure at first, he calmed down and only made an escape attempt once or twice. We were able to scrub him down with shampoo and rinse him with little objection and something that could have taken an hour turned into a pretty painless affair. The adventures of the day didn’t end after Theo was clean. 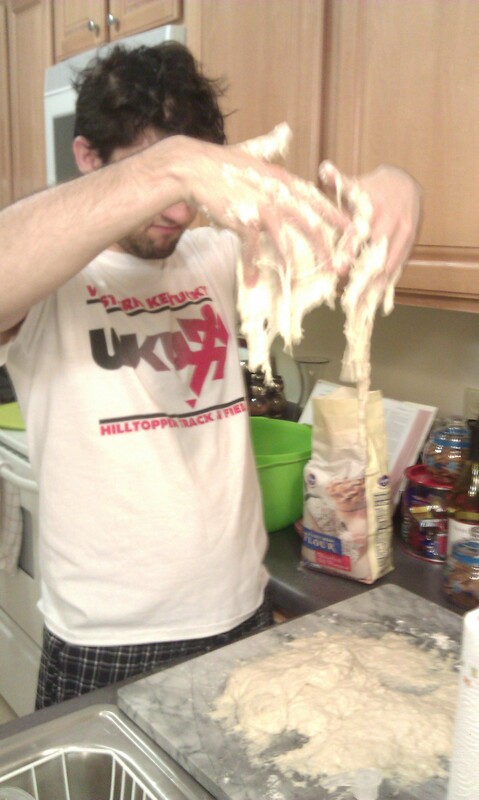 While in Owensboro over Christmas, Jim taught Drew how to make his infamous delicious bread. We knew we made the first mistake when we used all-purpose flour instead of the necessary bread flour. It still looked salvageable until we tried to knead it; it was nothing more than slime that slipped through our fingers. Laughing and chalking it up to a learning experience, we trashed the batch. The good thing about making bread is that there’s a starter mix you have to constantly “feed” so we’ll have plenty more chances to redeem ourselves. Bread making is harder, and more time consuming, than I thought but I’m sure our eventual end result will be a good—and tasty!—one. 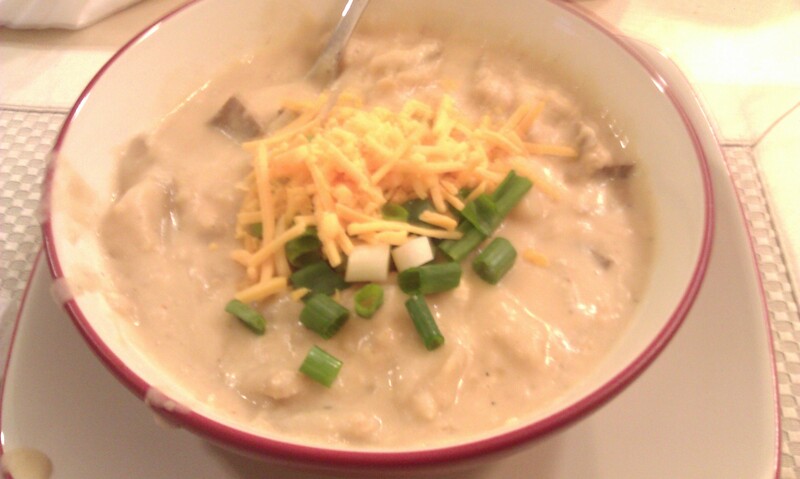 In other culinary endeavors, I made a baked potato soup from a recipe I’d seen on Pinterest a few weeks back. 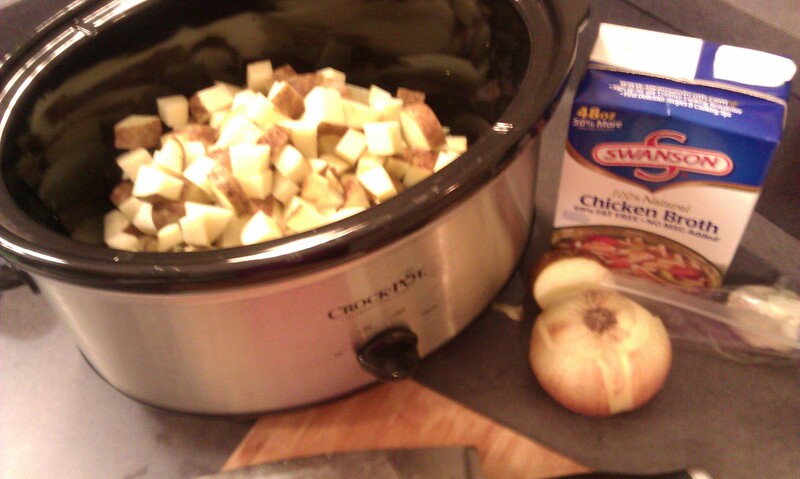 It was the perfect opportunity to try out our new slow cooker we received from Uncle Doug as a Christmas present. The recipe was extremely easy and as we smelled it cooking all day, it was hard not to dig into it right then and there. Our patience paid off and after gathering some garnishes together (green onions, sharp cheddar cheese and chopped bacon) we sat down to eat. The soup was absolutely delicious, very reminiscent of the Cheddar’s kind. Surprisingly filling too; by the time we got the bottoms of our bowls we were absolutely stuffed. We made quite a bit so we will probably have it for lunch after church tomorrow as well. The recipe can be found here, if you want to give it a try sometime. I highly recommend it—it’s going to be a regular in our kitchen! I would have loved to have been a fly on the wall when you all gave Theo a bath! Sounds like a pretty productive and fun day. Enjoy your Sunday and second round of potato soup!! I just wrote down this recipe too–I can’t wait to try it–the pictures definitely speeded up the process!! Reading your posts is like having a little visit with you–thank you for sharing!! Have a good day! !